A tropical disturbance is on the verge of becoming the next tropical depression in the eastern north Pacific. It is centered near 10° N / 110° W or about 890 miles south of Cabo San Lucas. It is moving west northwest at about 8 mph. Satellite imagery shows steady organization today with banding taking shape. The last Quickscat didn't quite have a closed surface low, but probably is close now. Tropical depression 4 - e is centered near 9.8° N / 112° W or about 910 miles south of Cabo San Lucas. It is moving west at about 8 mph. Officially as of the last advisory top sustained winds were 30 mph. We believe that top sustained winds are now up to 35 mph and that tropical depression 4 -e will will become tropical storm Carlos by later today. I.R. satellite imagery makes it tough to tell where the exact center of circulation is located. It appears that the center is just south of 10° north. It's possible that the mid level and surface center are not vertically stacked though. It will be several more hours before the visible satellite imagery can help. Forecast models show this system slowly strengthening and becoming a hurricane by late Sunday. The outflow aloft looks good and shear looks not to be a problem. It's possible that the models are a bit slow here and that it may reach hurricane strength earlier. This tropical system is not a threat to Mexico. Tropical depression 4 - e is centered near 10.2° N / 113.0° W or about 890 miles south southwest of Cabo San Lucas. It is moving west at about 12 mph. Officially as of the last advisory top sustained winds were 35 mph. We believe that top sustained winds are now up to 40 mph. Outflow looks good and there's no reason that we see that the strengthening trend will not continue. Three is a good chance that this system will become a hurricane by Sunday. This tropical system is not a threat to Mexico. Tropical storm Carlos is centered near 10.2° N / 114.7° W or about 925 miles south southwest of Cabo San Lucas. It is moving west at about 14 mph. Officially as of the last advisory top sustained winds were 40 mph. We believe that top sustained winds are now up to 45 mph. 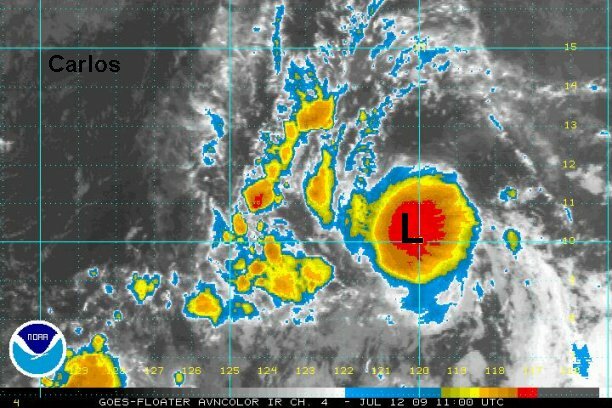 Satellite imagery shows deep convection steadily building and Carlos is on pace to become a hurricane by Sunday....assuming about the same rate of intensification. Tropical storm Carlos is centered near 10.2° N / 116.3° W or about 965 miles south southwest of Cabo San Lucas. 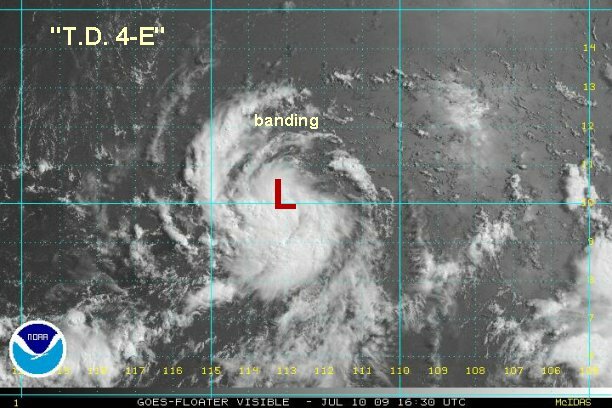 NHC placed their center under the deepest convection. We're just a little southeast of there. It's really tough to know the exact point in this stage of development and with I.R. imagery. It is moving west at about 13 mph. Officially as of the last advisory top sustained winds were 65 mph. This estimate looks good to us at this point too. 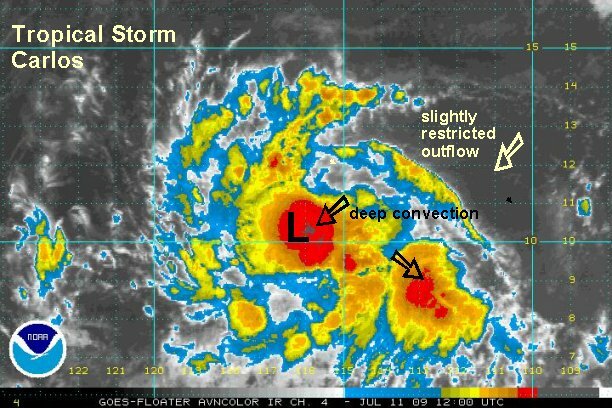 Outflow looks favorable for development. It is only restricted a little in the northeast quadrant. A large convective burst is now also occuring. 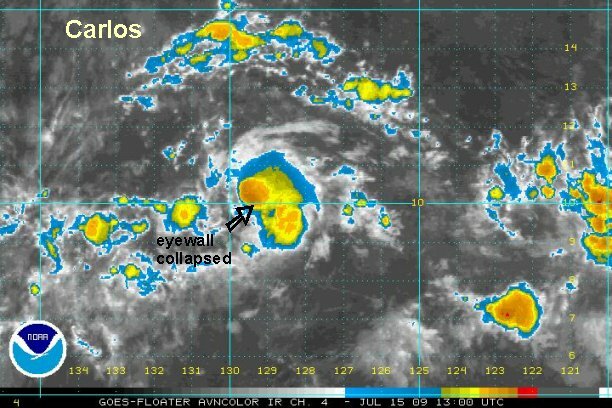 At this pace Tropical storm Carlos could become a hurricane by later today. 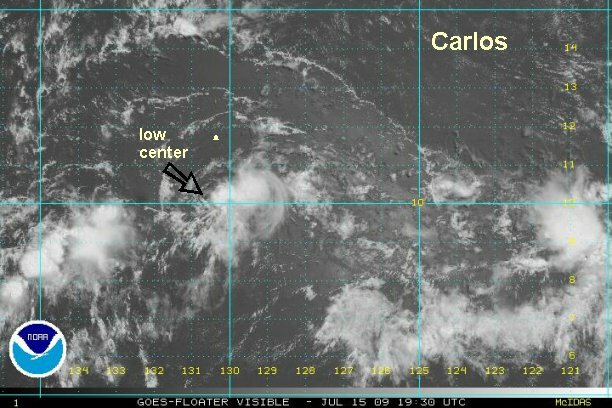 Tropical storm Carlos is centered near 10.5° N / 118.4° W or about 1015 miles south southwest of Cabo San Lucas. It is moving west at about 12 mph. Officially as of the last advisory top sustained winds were 80 mph. This estimate looks pretty good to us. It may be closer to 85 mph now. The eye has clouded over with some high clouds. The core of strongest winds only covers a small area. Tropical storm Carlos is centered near 10.5° N / 120.3° W or about 1090 miles southwest of Cabo San Lucas. It is moving west at about 12 mph. Officially as of the last advisory top sustained winds were 85 mph. We think that this estimate is way too high. We are estimating 70 mph, which is in line with recent satellite estimates. NHC is basing their higher estimate with model treands which may Carlos a major hurricane in a few days. This trend has been interupted and the models are wrong for now. 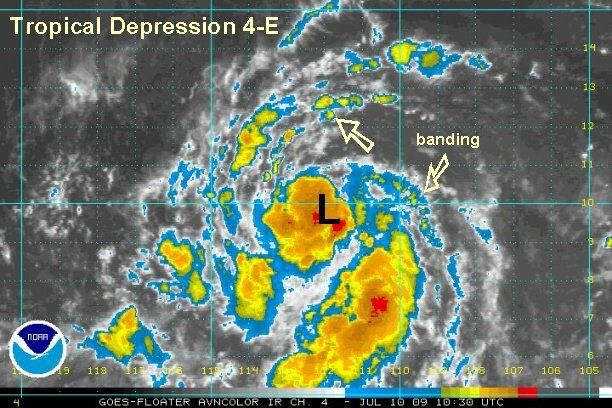 It's possible that a new strengthening phase may begin again later today or tomorrow. 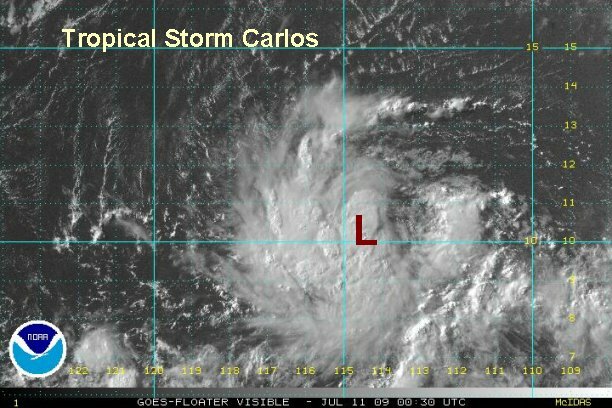 Carlos strengthening slightly after becoming disorganized earlier today. Tropical storm Carlos is centered near 10.3° N / 123.30 W or about 1250 miles southwest of Cabo San Lucas. It is moving west at about 12 mph. Officially as of the last advisory top sustained winds were 60 mph. We think that this estimate is a little too high. We are estimating 55 mph. NHC followed our lead and dropped their estimate from 85 to 60 mph. 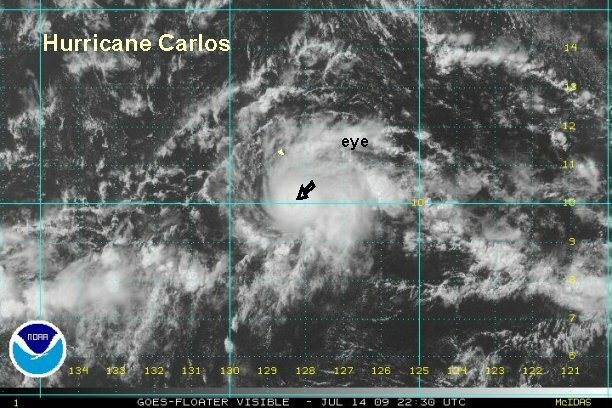 In reality, Carlos probably dropped down to about 45 mph late this afternoon. It is actually making a comeback now with deep convection refiring near the circulation center. NHC had this system up to a minimal cat 3 early today.....which the models supported. Thier new forecast now has minimal cat 1 strength. This again illustrates how the models sometimes are really bad. Tropical storm Carlos is centered near 10.0° N / 124.8° W or about 1320 miles southwest of Cabo San Lucas. It is moving slightly south of due west at about 13 mph. Officially as of the last advisory top sustained winds were 55 mph. We think that this estimate is slightly generous. We'll go will 50 mph. Quickscat missed getting an estimate on the last few passes. This storm is now about half way between Mexico and Hawaii....in no mans land. Models are still calling for some strengthening.....but they were very wrong before. 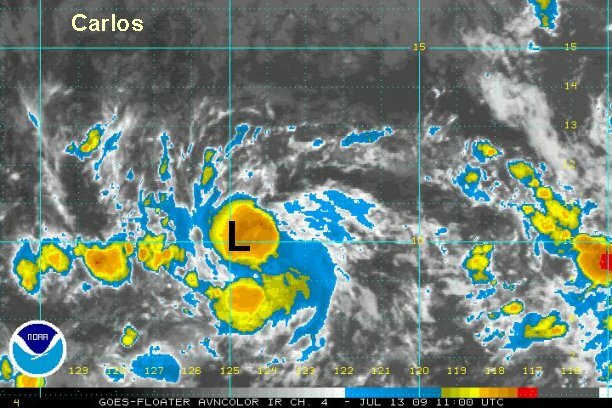 Tropical storm Carlos is centered near 9.7° N / 126.2° W or about 1400 miles southwest of Cabo San Lucas. It is moving slightly west at about 13 mph. Officially as of the last advisory top sustained winds were 65 mph. We are going with top sustained surface winds of 50 mph. This is in line with recent satellite estimates. Even though the organization has increased, the convection area is small in the center of circulation. 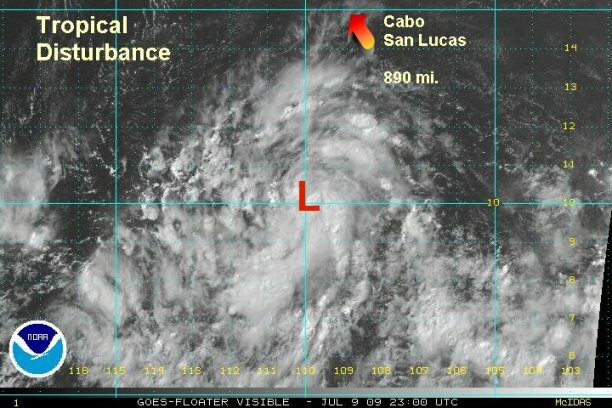 Hurricane Carlos is centered near 9.9° N / 127.4° W or about 1450 miles southwest of Cabo San Lucas. Overnight it has slowed and turned over the past few hours now moving northwest at about 6 mph. Officially as of the last advisory top sustained winds were 75 mph. That looks close to us. Carlos is tiny. 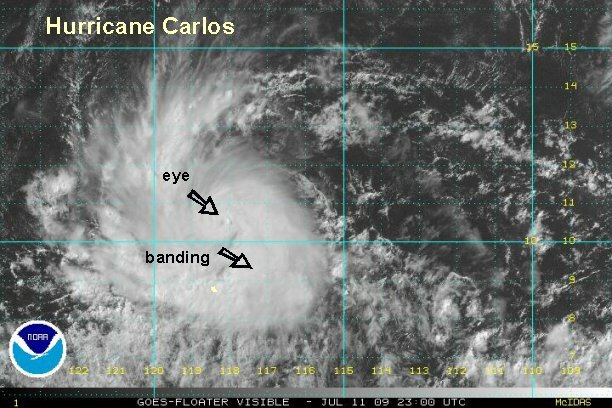 The cdo or circular cloud area around the eye is only about 120 miles wide. NHC estimates that hurricane force winds extend out only 10 miles from the eye. We've got to agree since this hurricane is so small. 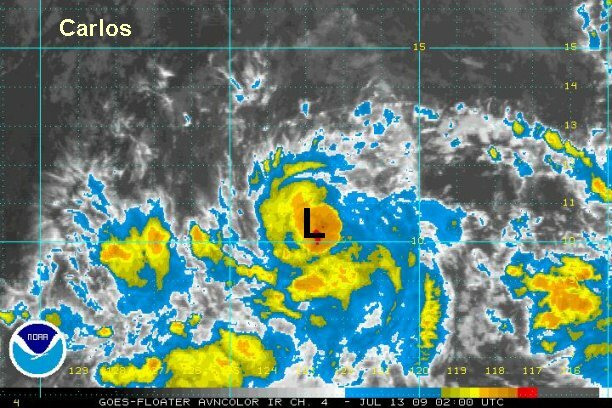 Hurricane Carlos is centered near 10.0° N / 128.3° W or about 1500 miles southwest of Cabo San Lucas or 1900 miles southeast of Hilo, Hawaii. It is moving west at 8 mph after the northwest jog this morning. Top sustained winds were estimated at 100 mph last advisory. This looks close or a little low. Small huricanes can "spin up" very quickly. The eye has clouded over during the past couple of hours. 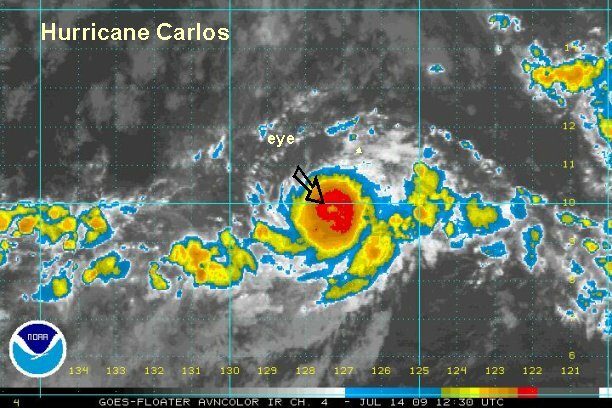 Hurricane Carlos is centered near 10.0° N / 129.5° W or about 1560 miles southwest of Cabo San Lucas or 1820 miles southeast of Hilo, Hawaii. It is moving west at 7 mph. Top sustained winds were estimated at 105 mph last advisory by NHC. This looks way too high. The eye disappeared a few hours ago. At the same time cloud tops are warming and it looks as though the southern eyewall is gone. We are estimating 60 mph. As mentioned earlier, very small systems can strengthen or weaken very quickly. We're not sure if NHC will drop their winds this low, but they will adjust significantly downward too. NHC just updated their 8 am pdt advisory to 85 mph. Amazing considering the satellite imagery. We'll still go with 60 mph and that's probably generous. 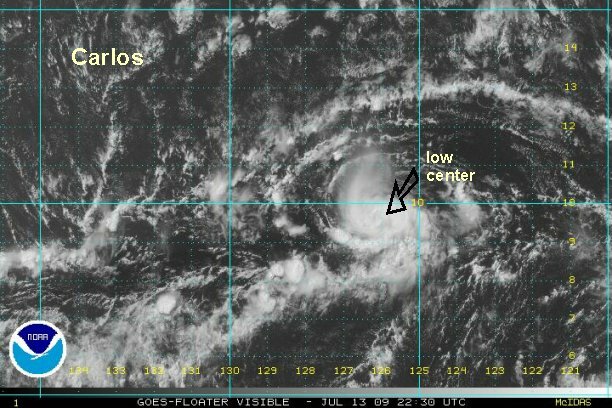 Carlos is centered near 10.2° N / 131.7° W or about 1675 miles southwest of Cabo San Lucas or 1680 miles southeast of Hilo, Hawaii. It is moving west northwest at 9 mph. We are now estimating 40 mph top sustained winds. Westerly shear has exposed the center of circulation and only a little convection is on the east side of the circulation. NHC will update in the next half an hour. Carlos is fading away.